Dental Implants are the optimal choice for replacing missing teeth. In the majority cases in which patients are missing teeth, they are the best solution. A dental implant is a surgical titanium post which is placed into the bone of the jaw to support a prosthetic replacement tooth. The implant acts like the root of the tooth, holding it securely in place and transferring biting force down into the jaw bone. Whilst using the best technology and quality dental implants, because we don’t use third parties we are very competitive. 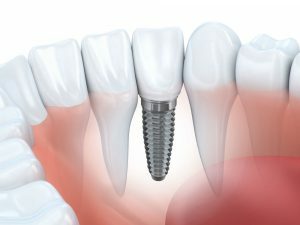 Single tooth replacement implants start from just £1350. Dental Implants can make you feel good about yourself again. You will look better, speak more clearly and feel healthier. You will first come in for a consultation with our oral surgeon who will assess your needs and work out a treatment plan with full costs. Once you decide to go ahead with treatment the oral surgeon will take x-rays and measurements before going ahead with the treatment. Implants are placed under local anaesthetic and recovery is quick, you just need to take it easy for a few days and you’ll be able to return to work the next day.